-Excellent size for a wing prospect at 6' 9.75 in shoes. Solid frame that he's done a great job of maximizing. Not overly long but measured an 8' 10 standing reach, which, if accurate, would allow him to play some small-ball four like a Sam Dekker type. -Fluid athlete who can play above the rim in space. Great in transition. Runs the floor hard. Can fill the lanes or push himself (although his handle is a bit rigid). -Aggressive straight line slasher. Attacks closeouts with long strides. Doesn't shy away from contact. -Nice overall feel for the game. Knows how to play a role. Experienced for his age. Can make the basic pass. 2.7 lifetime assists per 40 minutes. -Streaky but developable shooter with time and space. Lifetime 32.4% from three and 74.6% from the free throw line. Gets good rotation. -Very competitive defensively. Willing to check multiple positions. Plays with toughness. Solid feet on the perimeter. Good lower body agility for his size. Will battle in the post vs bigs. Sticks his nose in for rebounds. Finds ways to impact the game even if he isn't scoring. -Moves off the ball. Crashes the offensive glass. Does a lot of little things that don't show up in the box score. -Nice frame but not overly long relative to his height (6' 9.5 wingspan). Measured a big reach but questions remain regarding how much four he can play at the NBA level at 211 pounds with a sub-par wingspan. -Not a reliable spot shooter. Needs time and space. Slight side to side movement at the top of his release. Forward jumper. Gets rotation but not a natural shooter. Easy to run off of spots. Doesn't have a lot of confidence in his catch and shoot three vs lengthy closeouts. -Travels while attacking closeouts. Fluid after he puts it down but shuffles his feet when run off spots. Too sped up vs pressure. -Handle is raw. Ball slows him down, even in the open court. Carries vs pressure. Not a guy who's going to regularly play out of a ball screen or create in the half court. Best in transition or as a straight line slasher/cutter. Not a guy who's going to get to his jumper off the dribble. Driving to finish not to pull up. -Lack of elite length limits him a bit around the rim at times. Can improve his off hand as a finisher. -Does a lot of little things well but what is his elite skill? Good athlete in Europe but tools and athleticism aren't exceptional at the NBA level. All week long Sederskis impressed with his positional size, fluidity, intangibles, and toughness, proving he's certainly draftable in the second round whether it be in 2017 or 2018. He may not have an elite skill and didn't exactly take the Moda Center by storm during game play but the Lithuanian forward is an ideal draft and stash candidate as he continues to develop his shooting stroke. He'll have to make shots consistently to carve out a role in the NBA, but Sederskis did help himself a bit with his steady play on a World Team that was otherwise quite underwhelming. On the European front, Tadas Sedekerskis gives the team some much needed positional versatility, with his ability to play anywhere from 2-4 or even as a ball-handler in a pinch. The Lithuanian is a decorated and experienced player at the international level, with four FIBA events under his belt despite having just turned 19, including a strong showing at the U18 European Championship in Samsun, where he helped his team reach the Gold Medal game (where they lost to Frank Ntilikina and France). He even has experience playing in the more up and down American youth-settings from his participation last summer at the NBPA Camp in Virginia. Sedekerkis has great size (standing somewhere between 68 or even 69) for the wing, an excellent feel for the game, and real toughness that manifests itself defensively and on the glass. He is a talented ball-handler who loves to push the ball off the defensive glass, and has already seen some minutes playing in the ACB and Euroleague. He was expected to be more of a candidate for the 2018 or 2019 NBA Drafts due to his inconsistent playing time at the pro level this season, as well as his streaky jumper, but this event could change things as hell likely have a featured role. Lithuanian forward Tadas Sedekerskis discusses his strengths and weaknesses at the U18 European Championship, with accompanying video from the tournament. 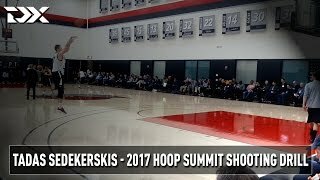 -Lithuanian wing Tadas Sedekerskis has long been considered one of the top European prospects in his generation, and he'll have a chance to build on that with a strong showing in Toronto. He has excellent physical tools, ball-handling ability and creativity, giving him plenty of upside to grow into as he matures and hopefully improves his perimeter shooting ability. Averaging 6.8 points and 2.4 rebounds per game playing for Huesca in the Spanish 2nd division, the young swingman has been solid playing against players significantly older than he is, but is shooting just 29% from beyond the arc. An interview with 6-8 Lithuanian wing Tadas Sedekerskis at the 2015 FIBA U18 European Championship in Volos, Greece.